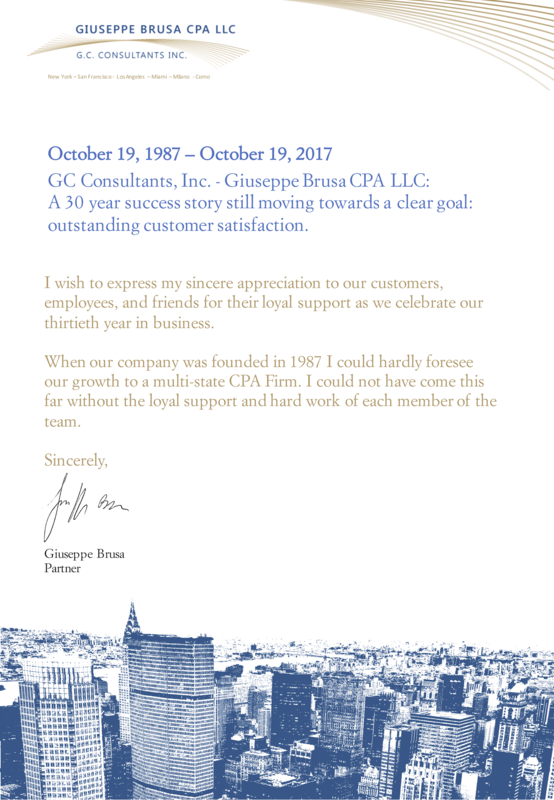 Giuseppe Brusa CPA LLC - GC Consultants - Individual Tax Return Checklist – April 15, 2019 deadline – Get ready! Individual Tax Return Checklist – April 15, 2019 deadline – Get ready! It’s that time again! The earlier you prepare for the looming April 15, 2019 tax deadline, the easier it will be to file your taxes. Please take some moments to download, review and fill-in the checklist, then forward it to us via PDF file with copy of your documents. Feel free to contact us should you have any questions. Thank you for your continuous cooperation. Please be advised that due to new state data requirements aimed at fraud prevention, state electronically filed returns and extensions require Driving License or ID number and State. In vista della scadenza del prossimo 15 aprile 2019, Vi alleghiamo un elenco indicativo delle informazioni e dei documenti necessari alla preparazione delle dichiarazioni. Vi preghiamo di scaricare e completare il modulo-checklist con i Vostri dati e inviarlo ai nostri uffici via PDF. Non esitate a contattarci per qualsiasi evenienza o chiarimento. 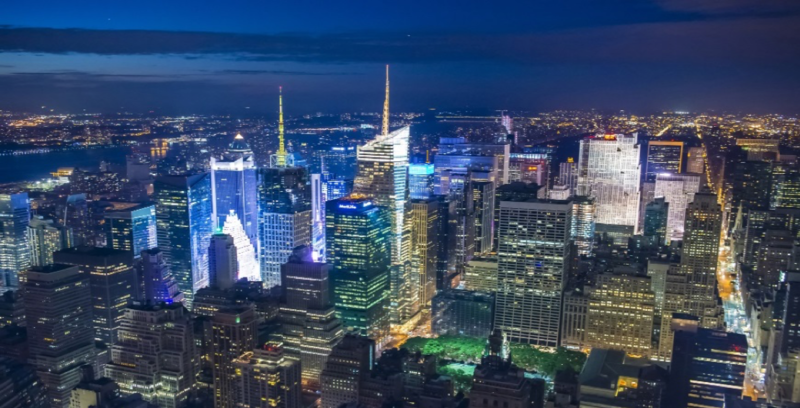 As you may already know, starting August 2nd, 2018 GC Consultants, Inc. will be undergoing interiors renovations at its New York office located at 444 Madison Avenue, Suite 1206. The completion of these renovations will be on August 21st, 2018. Our Florida and California offices will not be affected. Our operations will continue though we realize that our customers will be inconvenienced to some degree while we are in the midst of all the construction. We want to thank you in advance for your patience and understanding as we all try hard to work around it. The Financial Accounting Standard Board (FASB)’s lease accounting standard change, Accounting Standards Update (ASU) 2016-02, Leases (Topic 842), presents dramatic changes to the balance sheets of lessees. The ASU affects all companies and other organizations that lease assets such as real property, airplanes, and manufacturing equipment. The standard is effective for US Generally Accepted Accounting Principles (GAAP) public companies for fiscal years, and interim periods within those fiscal years, beginning after December 15, 2018. For private companies (i.e., those not meeting the FASB’s definition of a public business entity), the standard is effective for fiscal years beginning after December 15, 2019 and interim periods beginning the following year. Early adoption is permitted. The new standard must be adopted using a modified retrospective transition, and provides for certain practical expedients. Transition will require application of the new guidance at the beginning of the earliest comparative period presented. Early application will be permitted for all organizations. Under the new guidance, a lessee will be required to recognize assets and liabilities for leases with lease terms of more than 12 months. Consistent with current GAAP, the recognition, measurement, and presentation of expenses and cash flows arising from a lease by a lessee primarily will depend on its classification as a finance or operating lease. However, unlike current GAAP—which requires only capital leases to be recognized on the balance sheet—the new ASU will require both types of leases to be recognized on the balance sheet. For leases with a term of 12 months or less, a lessee is permitted to make an accounting policy election by class of underlying asset not to recognize lease assets and lease liabilities. If a lessee makes this election, it should recognize lease expense for such leases generally on a straight-line basis over the lease term. Please contact us if you have any questions on how these changes affect your company. 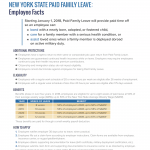 As of January 1, 2018, most employees who work in New York State for private employers are eligible to take Paid Family Leave. – assist loved ones when a family member is deployed abroad on active military service. Employees can continue health insurance while on leave and are guaranteed the same or a comparable job after the leave ends. 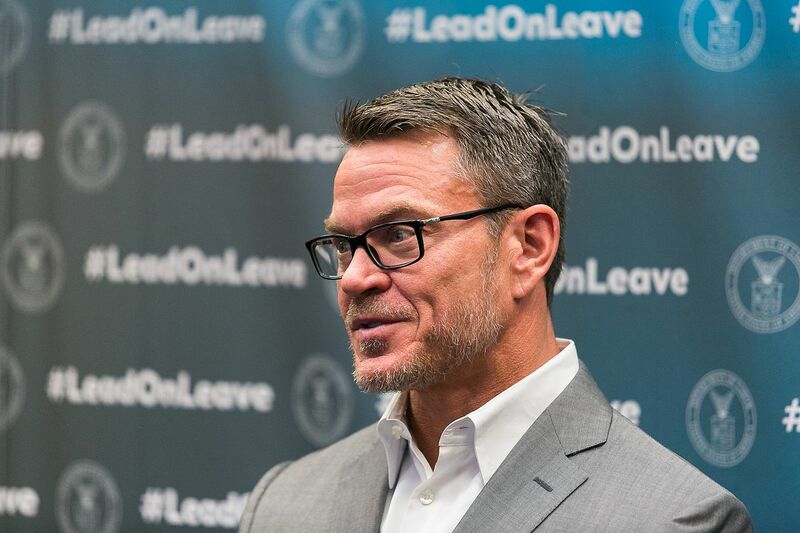 Businesses play an important role in implementing Paid Family Leave. Insurance coverage for Paid Family Leave benefits generally will be added to an employer’s existing disability benefits policy. 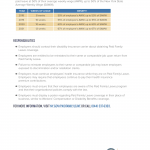 Paid Family Leave coverage is funded by employee payroll contributions. – continuation of health insurance while out on Paid Family Leave. Most private employers with one or more employees are required to obtain Paid Family Leave insurance. Contact your broker or insurer for information about available policies as well as options for paying your premium (e.g., whether it can be paid semi-annually, annually, or annually on a retrospective basis). This insurance is generally added to an existing disability insurance policy. Update appropriate written materials distributed to your employees, such as employee handbooks, to include Paid Family Leave information. If you do not have a handbook, provide written guidance to employees concerning their Paid Family Leave benefits. Update your payroll processes to collect the employee contributions that pay for this insurance. It is strongly recommended you notify employees before withholding any contributions. Identify employees who will not meet the time-worked requirement for and offer them the option to waive coverage. Your insurance carrier will provide you with a notice to employees (Form PFL-120) stating that you have Paid Family Leave insurance. Post and maintain this notice in plain view, similar to how the signage for workers’ compensation and disability insurance is displayed. 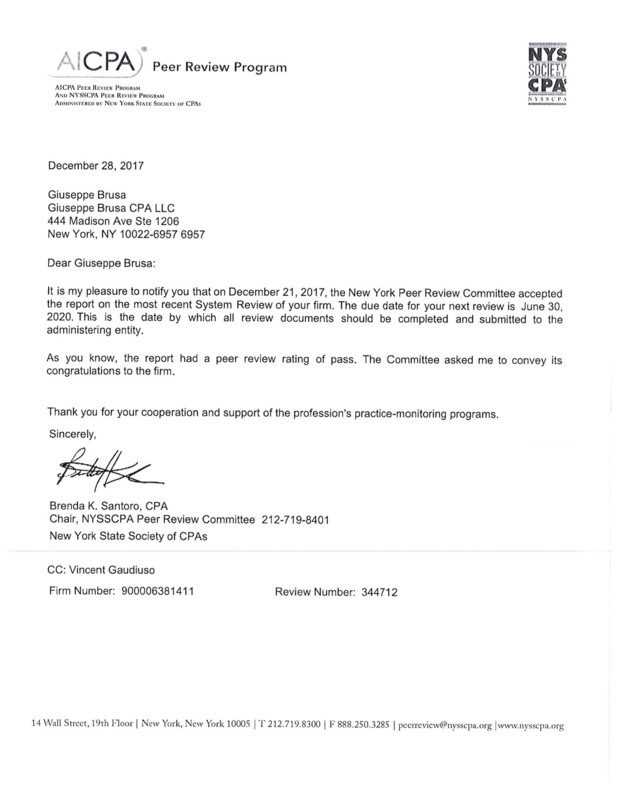 I am proud to share with you the AICPA Peer Review Committee communication regarding our most recent Review of the System of Quality Control. A special thank goes to my team for their hard work and dedication during the years. 100% deduction for qualified property through 2022, then phased down over 5 years. The two-year carryback and 20-year carryforward periods would be eliminated, allowing the NOL to be carried forward indefinitely. The NOL deduction would be limited to 80% of the taxable income. 50% of share of the W-2 wages of the S-Corp.
25% of W-2 wages plus 2.5% of allocable share of the unadjusted basis of the building. Standard deduction increases to $12,000 for individuals, $18,000 for head of household and $24,000 for married couples filing jointly. Personal exemptions will be eliminated. State and local Tax deduction can be combined with property taxes to reach and not to exceed a total amount of $10,000. Mortgage Interest can be deducted on the interest paid on the first $750,000 of mortgage debt for a first and second home. No home line of equity can be deducted. Medical expenses above 7.5 percent of a taxpayer’s adjusted gross income can be deducted for 2017 and 2018; 10% thereafter. Student Loan Interest can continue to be deducted up to $2,500. Alimony for divorce or separation instruments executed after December 31, 2018, will no longer be deductible by the payer, nor will it be includible in income of the payee. Trump’s Tax Reform Plan, or not…. A few highlights of what is supposed to happen in the next month or so, and a crucial caveat: nothing is written in stone…. so, stay tuned. In the past month, both the House Ways and Means Committee (“House”) and Senate Finance Committee (“Senate”) have proposed a tax legislative bill to revamp the current US tax code. The House released its proposal on November 2; the proposal was passed in the House of Representatives after a vote on November 16. The Senate released its proposal on November 10 and is scheduled to pass the bill to a full vote of the senate after returning from the Thanksgiving holiday. We have received many requests to determine the impact of the proposed bills. Both bills are complexed with a variety of changes for corporations, pass-through entities and individuals’ taxation. Changes will affect deductions, repeal of the estate tax, repeal of the individual and corporate alternative minimum tax, and a shift to a territorial system for foreign-sourced income. property placed into service for 5 years. would be limited to 90% of the taxable income. reduced from seven to four. interest paid on the first $500,000 of mortgage debt. interest paid on the first $1,000,000 of mortgage debt. Medical Expense deduction will be eliminated. 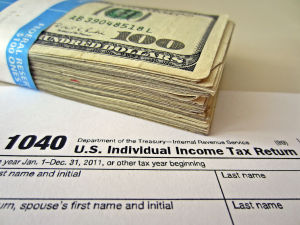 taxpayer’s adjusted gross income can be deducted. These proposals are not final and at this time it cannot be determined when or if either proposal will be passed. As noted above, there are key differences between the two bills that need to be resolved. The bill can only be passed into law once both the house and senate pass identical bills. 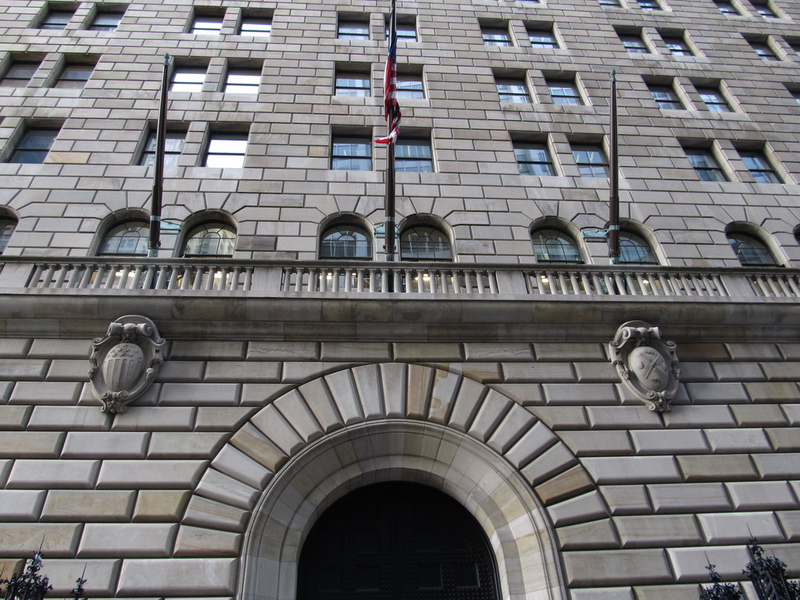 Banks have been required to enforce their Final Customer Due Diligence Rule and will “look through” both individual and nominal legal entity account holders to clearly identify them. KYC Policies enable banks to know their clients and comply with The FinCen guidelines with respect to the U.S. Bank Secrecy Act/Anti Money Laundering (AML) regulations. Under these regulations every financial institution has to obtain beneficial ownership and control information when an account is being opened. AML Compliance includes analyzing the account relationship, develop a customer risk profile and conduct ongoing monitoring to identify and report suspicious transactions. If you are an individual you will be asked to submit copies of your ID or passport, form W9 or W8Ben, and documents proving your current address. If you are a legal entity you will be asked to verify the legal status of the entity, the identity of the authorized signatories and the identity of the beneficial owner/s, and/or controllers of the account and the chain of ownership of the entity. If you refuse or delay your answer, the Bank is entitled to refuse to open new accounts or discontinue its relationship with you. Any questions or concerns? 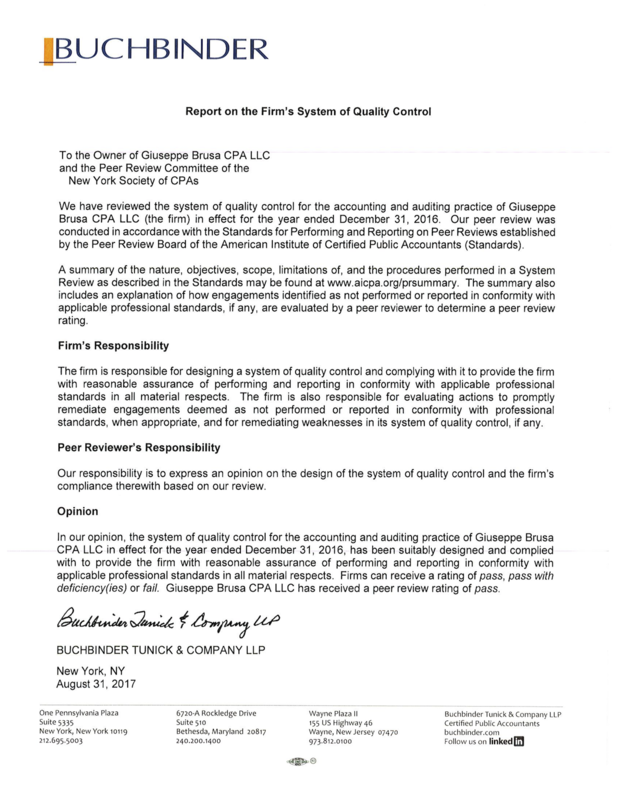 Please contact us, we at GC Consultants, Inc. are here to help you and clarify all your doubts. WASHINGTON — Aggressive and threatening phone calls by criminals impersonating IRS agents remain a major threat to taxpayers, headlining the annual “Dirty Dozen” list of tax scams for the 2016 filing season, the Internal Revenue Service announced today.